In the city of Oblitus, Memory Recoding is the norm: the alteration of one's memory which can be done in any way as long as one has the money. But Lysandra Ferry is convinced that someone has altered her memory without the money - even without her permission - because she cannot remember anything past two years ago. 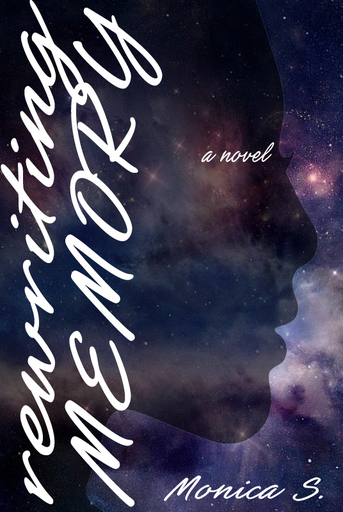 When she enlists the help of a mysterious Memory Recoder named Cale Ainsworth, he helps her discover the truth behind the gaps in her memory, and together they begin to chase after the fading threads that reveal a past Lysandra may not want to remember. The wind ruffled the red and orange leaves of the half-wire trees, and strangers walked on either side of her, keeping their heads down, never once casting a glance at her. A perfect day for masquerading. If only every day could be as perfect as this one. Her skirts swished around her ankles, and she held them up just slightly with her hands as she ran. She parted the crowds on the street with hardly a motion, and no one even looked up to wonder why she ran when they didn’t. The wind rushed through her long auburn hair, catching it on the breeze just as it caught those leaves on the trees around her, real or not. The wind did not rush through her hair when she sat in the window back at her father’s house; the screen blocked it. And her father’s servants seemed to think it was unbecoming of her to stare dreamily out the window in the first place. She felt her feet take her faster toward her destination, flying just a few centimeters above the ground, and even as she saw where she was supposed to stop, for a second she believed that she would not stop running. She believed that she would run forever, run down this very road until it ended, until the crowd vanished, until she had entered an alien world she had never seen. Lysandra turned to see Zephyr Winslow standing across from her, short hair framing her face, her eyes narrowed and her hand on her hip. Her skirts stuck out further when she did that; her hips looked twice as wide as they actually were. Lysandra had long since stopped trying to tell Zephyr that. “Fun,” Zephyr repeated, as though the word were foreign to her. “Yeah, I don’t think so. And hey, what took you so long? I thought we were supposed to meet here fifteen minutes ago.” She glanced pointedly up at the analog clock on a brass post at the end of the street, the hands pointing out the time, accusing: three forty-five. The two girls stepped off the curb and merged with the crowd, Zephyr in front and Lysandra behind. They cleared the street and took a right, a left, another left; they followed one street until they were the road’s only occupants. Zephyr stopped to look at a sign marking the street names, rusty and hidden behind the half-wire trees. “Yeah,” Zephyr answered, her voice echoing in the space of the empty street. “It’s just that way.” She pointed off to the left of the street sign. The other streets near the one on which they’d stopped were a little more crowded. People walked up and down the streets, and the occasional automobile or bicycle slipped by among the groups. Here, since it was Saturday morning, quite a few vendors had set up shop and begun to peddle their wares to anyone they could see. Zephyr and Lysandra blended in with the crowd and made their way up the street. Zephyr finally stopped and ducked under some low wiretree branches, pushing open a heavy oak door and stepping across the threshold into a dimly lit shop. The room was smaller than Lysandra’s own bedroom, with only a few tables scattered across the interior and a chair in the back by the window. Wiretree branches tapped against the glass, and their leaves blocked the view to the outside. “Where are we?” Lysandra murmured. She turned to a table next to the door and rang the bell that sat upon it. Within seconds, a man emerged from a door off to their left, tall and thin with unkempt reddish-brown hair. He had shining eyes of a silver hue. His outfit consisted of primarily black clothing except for a silver chain around his neck. When he caught Lysandra looking at it, he deftly pushed it behind his collar with a hand. “That would be me,” Zephyr answered, raising a hand. “Zephyr Winslow.” She shook his hand. “Take a seat,” Mason Viatrix answered. “Be back in a minute.” He disappeared through the door again. “But you weren’t even together that long,” Lysandra protested. Before Zephyr could say anything in response, Viatrix emerged from the door again, wearing dark gloves that matched the rest of his outfit. He had also attached an Electrode next to his ear. Lysandra thought it looked strange, a white sphere against a sea of dark red. “Hands,” Viatrix said, and Zephyr placed her forearms against the arms of the wooden chair. Viatrix clamped them down with devices that looked like handcuffs. Zephyr closed her eyes, and he ran his hands over her skull, following the back of her head and then her hairline. His brow furrowed as he stopped over a section of her skull, two fingers reaching out and scanning the area again. “Done,” he finally said, pulling his hand away. “So what is it you want Erased? Mind if I take a guess?” he added, lacing his fingers together and stretching his arms out in front of him. “I bet you can guess,” Zephyr confirmed, smirking. He moved his fingers over the spot on her skull again, over her right temple, and she shuddered once before he pulled his hand back and she opened her eyes. “One more time,” Viatrix answered. Zephyr closed her eyes, and he clenched his hands into fists, took a deep breath, pressed his fingers to her temple again. A pained look crashed over Zephyr’s face. The same look occupied Viatrix’s face for a second, and his whole arm went tense, the veins and muscles standing out in shadows and sharp contrast. Lysandra felt that a storm had fallen over the room. Zephyr relaxed first. She looked so calm she could have been asleep. Viatrix kept his hand on her temple for a moment longer before he, too, relaxed and stepped back. “Hard thing to want to get rid of,” Viatrix said, shaking out his hands. His face still lacked its color, while Zephyr looked brighter than ever. “Not really,” Zephyr said. Lysandra wondered if she even remembered what he was talking about anymore. She took Lysandra by the arm and dragged her out through the front door. Please find a publisher for this so I can hold a beautiful paper copy of it in my hands. That is all. It's interesting so far. My only comment is that in my opinion if you want to erase a memory, you wouldn't want to know that you had anything removed, which Zephyr seems aware of. However it's too early to say how the story will go so you may well have a plan for that so it's basically a moot point. Good luck with nanowrimo! Lysandra sighed. She hadn’t seen the introduction of Memory Recoding as solving problems at all. It had allowed the Empress to make criminals forget who they were. It had given citizens—those with enough coin, of course—the power to choose what they wanted to remember. But it had also ripped her parents away from her, and thanks to the unskilled hands of a certain Memory Recoder, she still remembered the day they had handcuffed her father and dragged him off to prison. She wanted to ask Zephyr what exactly it was she had chosen to forget—what Mason Viatrix had described as a hard thing to want to get rid of. The Memory Recoder’s face had gone pale at the discovery of the memory, and hadn’t regained its color even at the end of Zephyr and Lysandra’s visit. Lysandra wanted to know what Viatrix had taken from Zephyr’s head, what he had been so concerned about, but she knew asking would do her no good. It wasn’t as though Zephyr remembered anymore. “How do you stand it?” Zephyr wondered aloud. “I think I’d go mad if my parents yelled at me every time I left the house. I need space, you know?” She twirled in a circle in the middle of the street, stretching her arms out to her sides. “This time you get to follow me,” Lysandra said, and picked up the pace. She had a destination in mind, and let her feet guide her there. This was a place she and Zephyr had gone day after day for the last two years, a place she knew by heart, a place to which she could walk in her sleep without any trouble. At an intersection between streets, she jumped over the remains of a concrete wall that had been torn down long ago. She pushed through the tall grass that brushed against her thighs, scraping her worn boots through the dirt, ascending the steady incline of the hill until she and Zephyr stood at the crest. There she looked out over all of Oblitus as she had done for the last two years, studying the geometric pattern of streets and steady movement of people, the gilded edges of buildings and the organic leaves of the wiretrees. Lysandra sat down in the grass, tucking her legs under her and smoothing her skirts over her knees. “You said we came here before all that stuff happened,” she began. “What did we talk about?” Lysandra asked. “Caeberry is gross,” Lysandra said. “Deal,” Zephyr answered, pushing herself up from the grass. The two of them raced down the hill and back through the streets until they found their usual pastry shop. Lysandra remembered this shop, too, from the past two years. She and Zephyr had often gone there back when one of them was upset about something. There they’d talked—or just stayed completely silent—over cups of mint chocolate or plates of pike. That was before Zephyr had taken it upon herself to go see a Memory Recoder about it instead. Four o’clock was not one of the pastry shop’s busier hours, and Lysandra and Zephyr found their usual table, the one in the corner next to the front window, easily. They ordered two plates of vanilla pike and watched the crowds outside. Lysandra felt a stir of unease in her chest. She wanted to ask Zephyr about Oden. She wanted to know what her friend had felt the need to Erase without even telling her. That was the problem with Memory Recoding: it messed up the truth and who knew it. Two years ago, Zephyr would have just told Lysandra about her problems rather than getting a Memory Recoder to Erase them for her. Now, whatever had happened between Zephyr and Oden lived on in Oden’s mind only, and maybe not even his, depending on whether his will was as weak as Zephyr’s. But she couldn’t ask Zephyr about it. She couldn’t bring herself to ask, to ruin the rest of their trip out, or to incur her friend’s strange looks and reminders that even she didn’t remember. So she stayed silent. Lysandra had met Oden More once, while she and Zephyr were out on one of their escape runs. He was a boy of medium height and weight, the same age as both of them, with short, dark hair, pale skin, and a crossbow slung over his shoulder. Zephyr had apparently arranged to meet him somewhere, because Oden had stood there waiting until she and Lysandra had showed up. Zephyr had accidentally introduced Lysandra using her real name—“This is my friend Lysandra Ferry,” she’d said without a second thought—and Oden’s eyes had bugged out of his head. “You, too,” Lysandra had said. She just remembered feeling glad he hadn’t asked her for her autograph or something crazy. Not her father’s—no, her father had already been imprisoned by then. Zephyr had gone on for months and months about Oden to Lysandra. Lysandra had devised schemes to get them to go out. None of them had seemed to work, but one day Zephyr had dragged Lysandra along to that chance meeting, and Lysandra knew things had changed. She knew things had changed again when Zephyr decided to Erase Oden from her memory completely. “Of course Simon Ferry’s daughter would have expensive taste,” Zephyr teased. Zephyr’s eyes went wide, and her lips twitched, as though she searched for words but couldn’t find any appropriate enough. Finally she answered, “Some things are just too hard to talk out,” and looked away. Zephyr walked back to the Ferry estate with Lysandra, and they talked about inconsequential things—Zephyr’s work, the shops nearby, people they knew. Lysandra felt like a little bit of the weight had been lifted off her shoulders now that she had confronted Zephyr about the session with the Memory Recoder. She let the idea slip from her mind as they made their way back. “I’ll need it,” Lysandra replied as she pushed open the gates and waved to her friend over her shoulder. She walked up the paved road to her father’s estate. She always felt that this walk was the longest, that the dread was always worst when she walked up this road, watching the house loom ahead of her. Her father no longer waited for her there, but the house itself seemed to threaten the raised voices and punishments of his servants the moment she opened the door. Lysandra stopped at the front door and lifted her key from around her neck. She kept the long silver key on a leather chain and wore it wherever she went, partly a security measure and partly a reminder of her father’s imprisonment. She slid the key into the lock and turned it, pushing the door open as slowly as she could manage. Ismene, of course. Her father’s only female servant, who had acted like a replacement for Lysandra’s late mother the past two years, whether Simon had wanted her to or not. Her questions never sounded like questions to Lysandra—it was as if any answer she gave would be invalid. “With Zephyr,” she said anyway. “What would your father think if he knew!” Ismene cried. She stepped into the foyer, toes pointed, her skirts billowing out around her legs. She had her graying hair twisted up into a bun behind her head, and her expression contorted into one of rage and concern. She had lowered her voice, and this question actually came out sounding like a question. “I’m sorry?” Lysandra ventured, wondering if Ismene actually felt concerned about her, or if she just felt a duty to Simon to protect his property. Lysandra stared back at her. How do you think losing my memories makes me feel? she wanted to scream. How do you think losing him and my mother makes me feel? Do you think losing my freedom makes things any better? Lysandra strode into her room, shutting the door. As soon as she had created a barrier between herself and Ismene, she felt infinitely better. She slid down to the floor, her back against the wood of the door, and let out a long sigh. She hated encounters like this with Ismene or any of the other servants. They always referenced her father and what he would have wanted. Do you think my father would have wanted me locked up? Lysandra wanted to ask them. If you lock me up, I’ll be no better off than him. But she didn’t want to lose any more favor with them than she already had. It had taken her what felt like ages to refine the skill of keeping her argumentative words to herself, and even now keeping them inside felt like trying to hold back a massive deluge of rain with just one crepe paper umbrella. She walked to her window and looked out of it, her eyes landing on the spot where the Ferry estate’s walk met with the gate, and the road. No automobiles or carriages passed by, leaving the area empty. The view from her window had always made Lysandra feel like a prisoner. Today felt no different. She turned away, pushing both the sight of the road and the sound of Ismene’s echoing voice from her head. She hoped Zephyr would send her a note tomorrow, or she suspected she’d go mad from having to stay within these four walls.